On Thursday morning, Crossfields residents received a letter from Thames Water announcing lane closures on Deptford Church Street planned to start on February 10th and go on for two weeks. They want to dig a trench on the western side of the dual carriageway in order "to locate underground services in both the footway and highway." Only Crossfields residents have received this letter so far. Those who live on or near the high street (many of whom attended the demonstration yesterday) have not been informed yet, if they ever are. A map accompanied the letter which showed where the road would be dug up. It indicated that the work would happen in two phases over the two week period, but there was no information on how the traffic phasing would work, at what point the lanes would be closed, nor how it would affect the buses and bus stops. So we called them (0800 0721 086) to find out more. It turns out it is not quite as bad as feared – certainly not as bad as it will be if they get permission for this site. Only one lane on the western side will be closed (rather than the two lane closures proposed for 2017-2020). However, the bus stop next to Wavelengths will be withdrawn. Other bus stops will remain in operation. We were also told that two weeks was the maximum time the work would take and it may finish sooner. Since the information given has been rather inadequate, we've drawn up a quick map to show the two phases of lane closures as it was explained to us on the phone (click to enlarge). 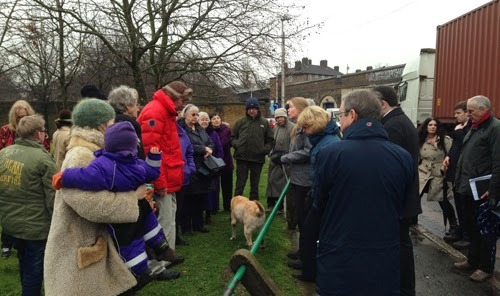 A good turn out of hardy locals yesterday – some with their dogs! – at Crossfields Green. They had come to meet the Planning Inspectors charged with making the decision on all the proposed Thames Tunnel sites in London. The Inspectors, accompanied by two Thames Water representatives and a Lewisham Council planner, had been walking around the area to acquaint themselves with the site's environs before they arrived back at the green to face the angry and very vocal residents. Leading the Inspectorate's team, a Ms Bessell told the campaigners that they were here to look at the site, and not to 'receive representations'. "People can do that at next Wednesday's Open Floor Hearing at Deptford Lounge", she said. But that didn't stop the complaints. One very upset Crossfields resident cried "You lot want to ruin our old age! You don't give a monkeys about people and kids!" The team took a verbal battering for almost fifteen minutes before moving on to look at the businesses on Crossfields Street, the bus stops on Deptford Church Street, and St Paul's Church. Thames Tunnel on Deptford Church Street : The Facts! The Don't Dump on Deptford's Heart campaigners with the help of Crossfields residents have distributed leaflets locally. Unfortunately the wrong day was posted for the Open Floor Hearing – it's Wednesday, not Tuesday. Please come along to the Lounge next Wednesday if you can! There is an alternative site by the river from which spoil and materials can be transported by river – tell Thames Water to use that instead! * THE FACTS...(Download the TRANSPORT ASSESSMENT here). These 140 construction vehicles will operate between 8am-6pm on weekdays and up to 1pm on Saturdays. 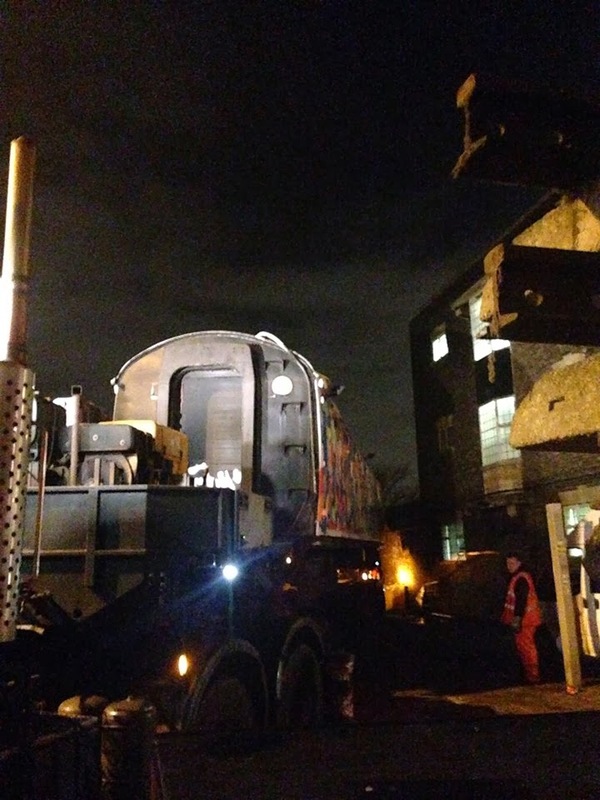 However, "in exceptional circumstances HGV and abnormal load movements could occur up to 10pm on weekdays for large concrete pours and later at night by agreements with the LB of Lewisham and TfL." 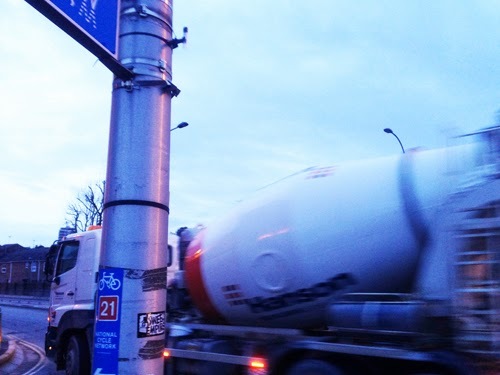 (p.65) 'Large concrete pours' means that several concrete mixers will line up in a row at the site, churning away loudly with their engines running before they get to 'pour'. Lucky Frankham, Congers and Finch! Lucky Holden and Wilshaw when this happens at Faircharm! Which it will! At Paynes & Borthwick Wharf it happened at 6am in the morning! In addition, there's the possibility that at least another 10 HGVs per hour may use Deptford Church Street coming from their Chambers Wharf site (and probably from their Earl Pumping Station site too). (p.88) The following image shows the predicted vehicle movements that do not include other development traffic (click to enlarge). As with all the other developments, there are also workers/staff vehicles and other related vehicles to take into account regarding parking. No provision is ever made for workers' vehicles (which is why Crossfields and Creekside are packed with parked vehicles owned by workers from the Cathedral construction site on the other side of the Creek). Expect Controlled Parking Zones and Residents Permits very soon! Surveys were conducted to assess pedestrian and cyclist flows. 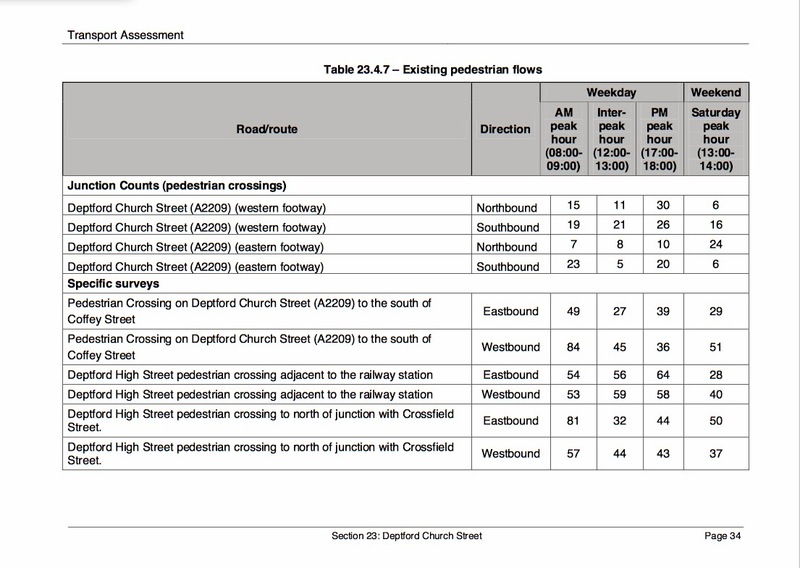 The pedestrian survey did not cover the signalled crossing by Wavelengths used by Crossfields residents exiting and entering the estate to access Wavelengths, the high street or the 47 bus stops. Of course it is not just Crossfields residents using this crossing, since members of the public use it to access Creekside and Greenwich. Statistics – who can disprove them? The cyclist survey shows up to 142 cyclists using Deptford Church Street during peak hours (see page 35). 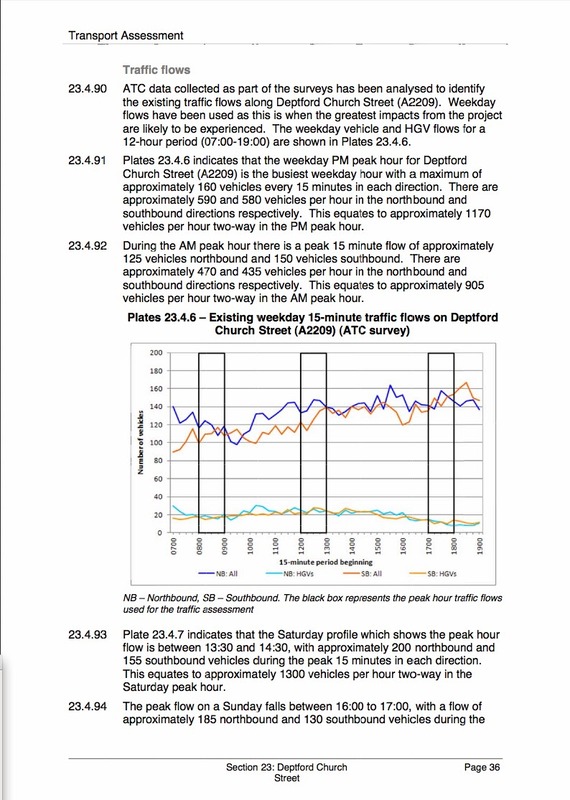 Their analysis of traffic flows shows approximately 1170 vehicles per hour on Church Street during the evening peak hour (5-6pm), and 905 in the morning (8-9pm). (Of course, any fool knows that evening peak hours are 4-7pm and morning starts at 7am). Their graph shows a rather low percentage of HGVs which locals may find hard to believe. On Saturdays during the peak hours of 1.30-2.30pm they recorded approximately 1300 vehicles per hour. And on Sundays between 4-5pm, it is apparently 1100 vehicles! How very odd! Almost as much traffic on Sunday as a weekday! What was going on in 2011 when these studies were carried out? 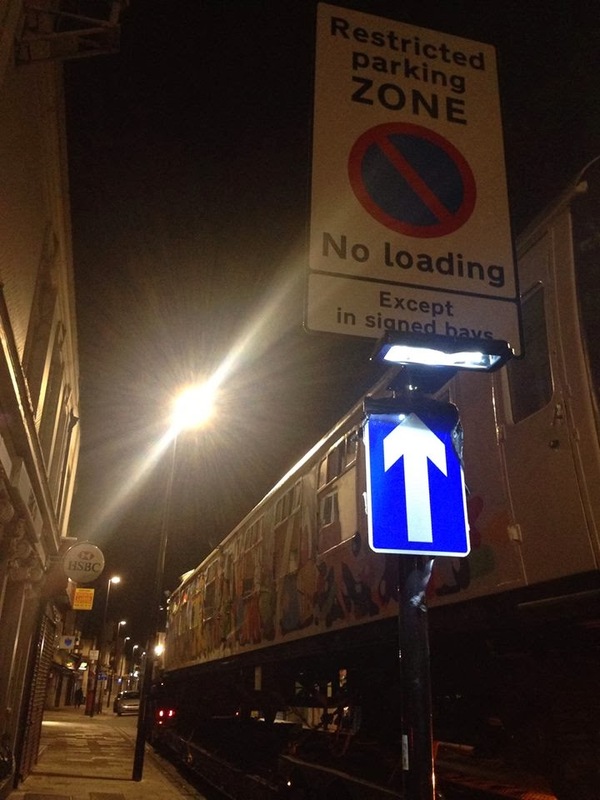 Junction surveys indicated there was a total flow of 3,360 and 3,600 in the AM and PM peak hours respectively using the junction at Deptford Broadway, of which 1,375 (AM) and 1,493 (PM) entered or exited Deptford Church St. 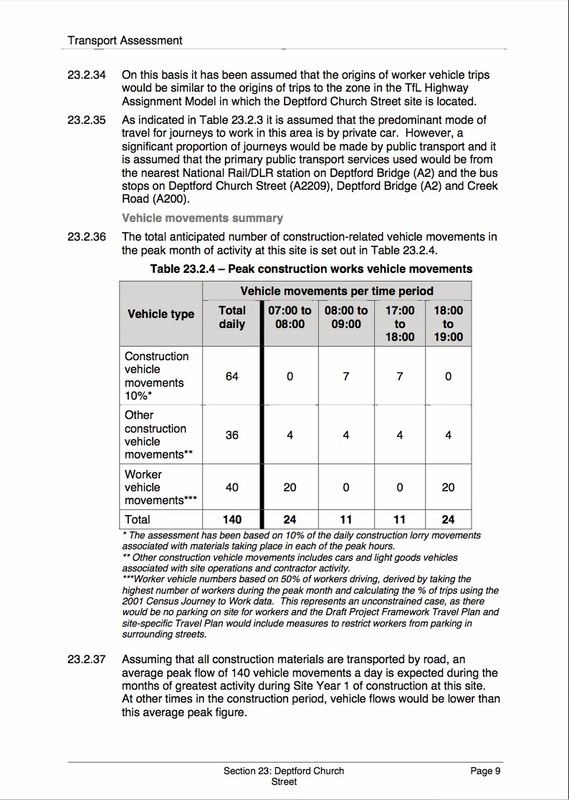 They note that this was an increase on TfL's own 2010 survey. (And also conflicts with the above figures!) There are no figures supplied for the junction with Creek Road. This is based on TfL figures which reported a total of 2 serious and 17 slight accidents over five years between 2006-2011, with no fatal accidents. They conclude the accidents were due to poor driving, not 'road geometry' and involved light and medium goods vehicles (not HGVs) and five cyclists. (See p.49). These figures are out of date. Young cyclist TJ was killed by a hit-and-run driver right next to the site in March 2012. Does his death not count? (They promise to give their HGV drivers 'awareness training'). They have into account new developments that would be complete or under construction within the vicinity of the site by Year 1 (p.52). Faircharm (which already has planning permission) is not listed at all – 180 lorries per day along Creekside and pouring out onto Deptford Church Street and Creek Road! Creekside Village East and Kent Wharf are also not listed (see our previous post). In tables we don't fully understand (pp.53 ad nauseum) they estimate delays to buses, traffic, cyclists and pedestrians in seconds – apparently no one will ever be delayed by more than a minute or two. It's worth noting they intend to remove the central barrier where the road narrow to two lanes, to give cyclists more room not to get mown down by HGVs, but how are emergency vehicles going to get through? We did a word search on the 312 pages of this document and searched for 'Emergency', 'Ambulance', 'Police', 'Fire'. Apart from a reference to a Fire Assembly Point for St Joseph's School, these words are not mentioned once in the entire document. What do TfL really think? We couldn't find any evidence via the public access to the Inspectorate website what negotiations may be going on between public bodies such as TfL. The information may be there, but we've lost the will to live. Where is Lewisham Council and Lewisham Homes in all this? 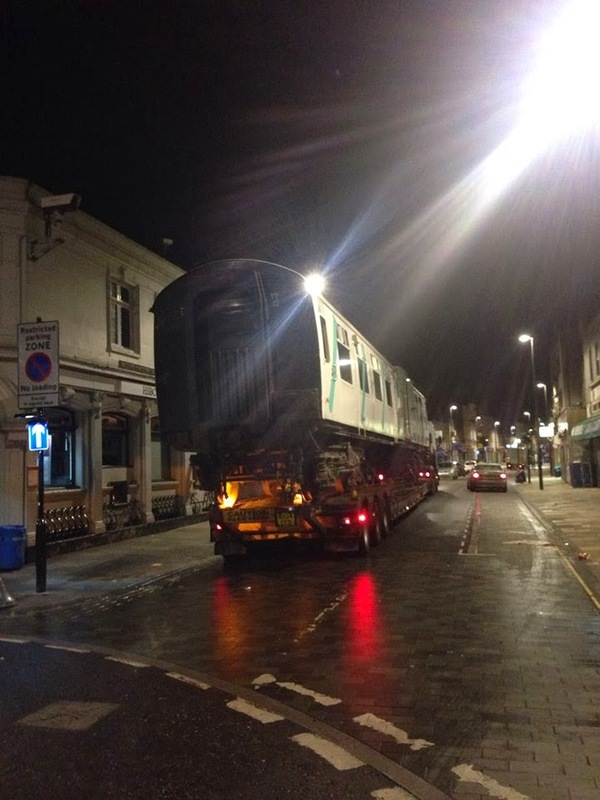 The Lewisham Planning Team have been in charge of this operation and have kept everyone in the dark. They have not, as far as we know, even consulted Lewisham Homes who have certainly not consulted their residents. Lewisham Planners are negotiating a Section 106 deal with Thames Water as we speak, with little (or no) communication with those most affected. Thames Water decision by 12th March 2014? Thames Water reckon this is enough information to get them through the planning stage. "It is acknowledged that these models may require further refinement as the project moves from planning to detailed design stage..." (p41). Of course for everyone using Deptford Church Street, Deptford High St, Creek Road, Deptford Broadway, the A2 and A200 and all the roads around, not objecting to this site at this stage will mean it's TOO LATE. On Monday 27th January, Baroness Kennedy QC spoke in the House of Lords about Thames Water's plans to site a Thames Tunnel ventilation shaft on Crossfields Green. She set out the devastating impact it would have on the local area. The site is "one of the only green spaces in that area, being next to a listed church and a residential estate, and being right next to a primary school". The construction – set to last for over three years – would bring "road closures, traffic mayhem and road safety fears. Obviously, there will be an increase in the level of noise and air pollution". She explained that the decision was "vehemently opposed by local residents", almost 1,000 of whom had signed a petition organised by Don’t Dump on Deptford’s Heart. The consultation had been "inadequate" with the original plans to site the construction tunnel on the riverside being changed with no adequate explanation. One of the justifications given by Thames Water for moving the site from the riverside to the centre of Deptford was that local people there already suffer from noise pollution, so won't notice a bit more. She slammed this as "totally unacceptable". She called on the Planning Inspectorate to recognise the flaws in their plans and the concerns of local residents. The full text of Baroness Kennedy's speech can be found in the Hansard records here. 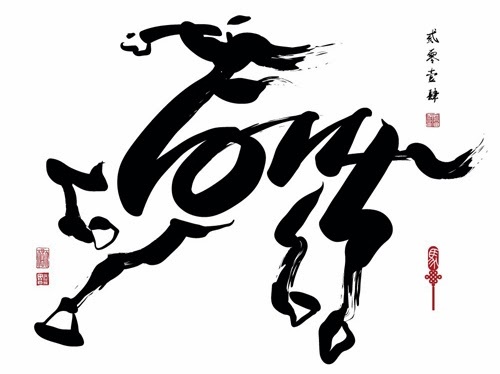 Deptford will be celebrating Chinese New Year this Saturday 1st February. We're told that from 12-1pm there will be Dragon Dancing outside the many oriental shops in the high street, organised by the shops themselves. Head for the north end of the street. There'll also be a traditional Chinese Lion Dance in Giffin Square from 2.10pm. The dancers will then process with live music to arrive at the Albany at 2.30pm. This short spectacle will end an extended lunchtime period of events in and around the Albany and Deptford Lounge (from 11am to 3pm), with Eastern cookery demonstrations, arts workshops and more. All part of the Albany's Yam Yam Festival – more details on the Albany's website. Thanks to blog.deparz.com for the illustration! Representatives of Bellway Homes have invited themselves to this Thursday's Crossfields Tenants & Residents Association's meeting at the Pink Palace (7.30pm start). * They would like to tell us about their plans to redevelop Kent Wharf. Kent Wharf is the area of derelict land next to the Laban and opposite Finch House. It backs onto Deptford Creek and, like almost all the property on both sides of the Creek, has been on the cards for redevelopment for some time. Recently, Kent Wharf was sold to Bellway Homes as one of 4-5 'parcels' of land surrounding the Laban. The other parcels form part of the originally much larger Creekside Village site that have also been derelict for some time. 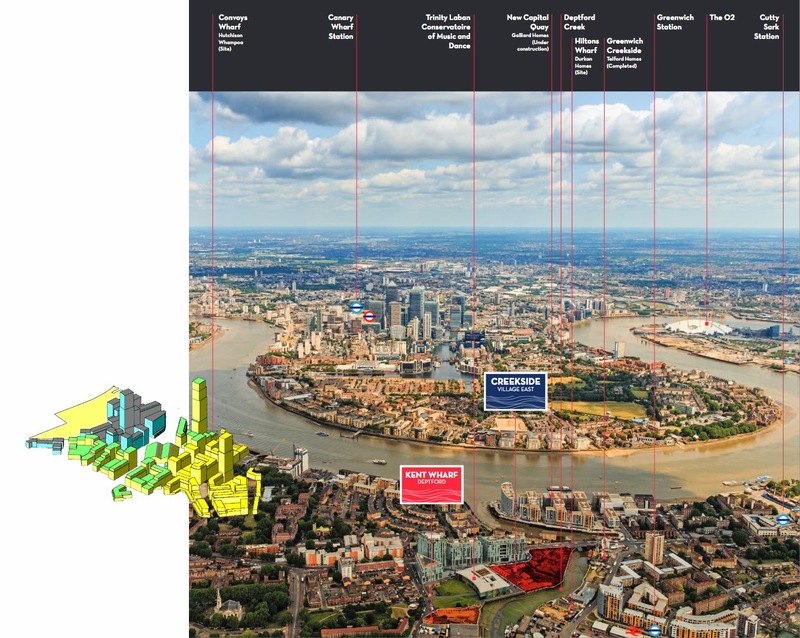 The land was marketed for the owners by DTZ ("a global leader in property services and corporate real estate solutions"), which put out a brochure in July 2013, from which the following two illustrations have been taken. (We have added Convoys Wharf to the first one, to add extra context – click both images to enlarge). As usual, the marketing blurb emphasises the transport links to Canary Wharf and the "close proximity of increasingly popular and continually improving Deptford Town centre, dubbed the 'new Shoreditch' with more artists per square mile than anywhere else in the capital". They suggest the new owner might build a "high quality residential-led mixed use development" of up to 100 apartments, which must include an element ("ideally a minimum of 20%") of employment floorspace with a focus on creative uses – to be situated on the ground floor since sensitive uses like residential cannot go there because of the flood risk! 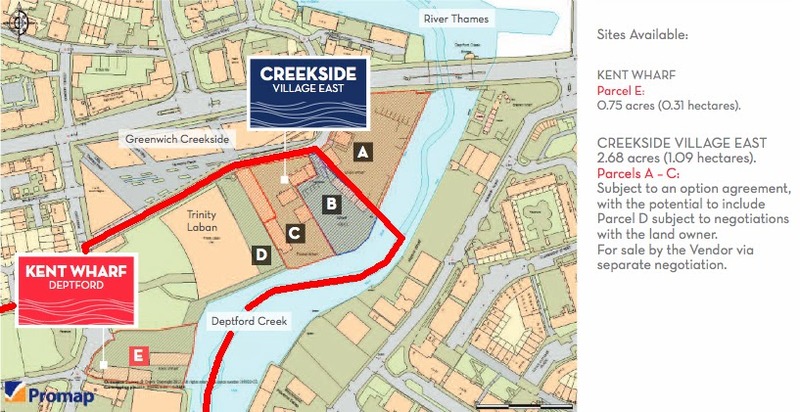 Hopefully, the Kent Wharf development, which comes under Lewisham, will not follow suit – although plans were rather speculatively drawn up some time ago by the Creekside Village architects Squire & Partners for the whole of Creekside, including Crossfields, to look like Creekside Village! 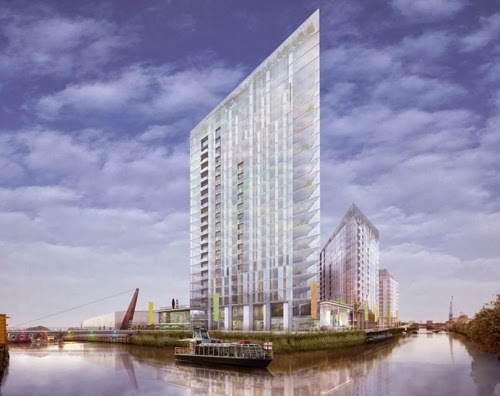 There's little chance of those plans being resurrected, but the Kent Wharf site might still include tall buildings – after all, Lewisham approved a 12-storey tower at Faircharm. And a quick look at Bellway Homes' rather bland developments in the capital do not inspire confidence. But whatever your opinion of the design of the buildings going up around here, it is the construction of these two new developments that will impact detrimentally on Crossfields residents. With 180 lorries a day already expected on Creekside from the Faircharm redevelopment (for three years) and Thames Tunnel's proposals to partially close Deptford Church Street (for three years or more), the environment surrounding Crossfields will just get worse and worse before it gets better. 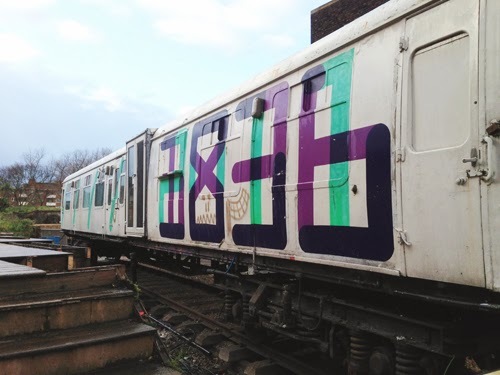 *The TRA meeting will also discuss MITIE works and Thames Tunnel proposals for Deptford Church St.
Deptford High Street's iconic train carriage is being moved this evening between 8pm and midnight (and possibly as late at 2am) and taken to be stored at Morden Wharf in Greenwich. The squatters are gone, the gates and decking have been removed and the Elvis loo looks a little sad, stranded on its own! We asked the café business owner Rebecca if it's coming back. She's said, "It wants to come back to Douglas Square. But there's a slight hitch in that the only place it could be sited (to prevent any issues with the existing structures like lighting columns and market trading spaces) is by the Albany. But the Albany is planning to move their front entrance to face the square which will be better for the building as a whole but means the carriage would only have a short time frame in the square. It would be expensive to move it again!" 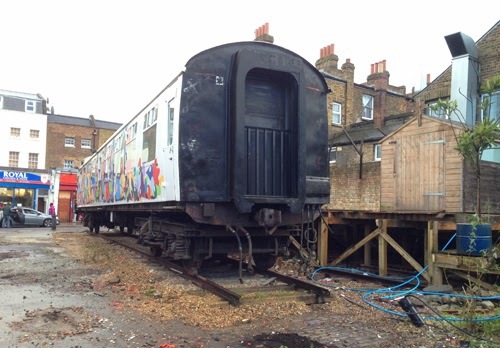 The train will be stored for the time being at Morden Wharf courtesy of Cathedral plc who are developing the riverside site on the Greenwich waterfront. Rebecca said, "The Council have been very helpful in navigating where the best place is for it to sit in the long term, and Cathedral are supporting my wish for it to stay in Deptford and not take it anywhere else." 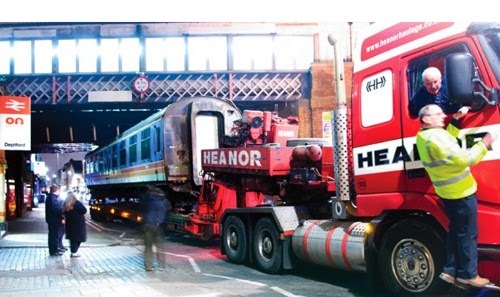 (The developer had at one point wanted to re-site the train at their new development in Brighton). "In the meantime I might open a little caff in the square just to keep the business going." We asked what's happening with the Elvis loo. "All the plants and decking have been saved and are going to Tidemill's Assembly garden project. The Elvis loo is still up but there's nothing much left to save and the squatters left it in a bit of a mess. They've also written all over the tables, walls and floor, and had electric heaters on 24/7." 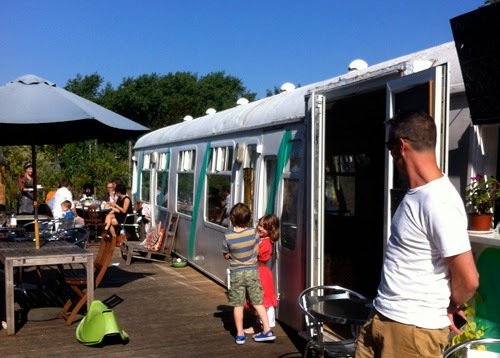 One of the squatters wrote in the comments section on our previous post about the carriage that they would keep the place clean, and even claimed to have changed the electricity bill to their own name. But it seems the more responsible among them were staying with their parents over the Christmas period when things got out of hand. During this period, a local shopkeeper witnessed an ambulance turning up to take a party-goer – who had overdosed on drugs – to hospital. The electricity is still in Rebecca's name. Was she having a special send-off tonight? "No special send-off. It's all been a bit emotional and a bit of a rush! Now it's time to focus on the future." She hopes people will have good memories of the train, and look forward to its return. 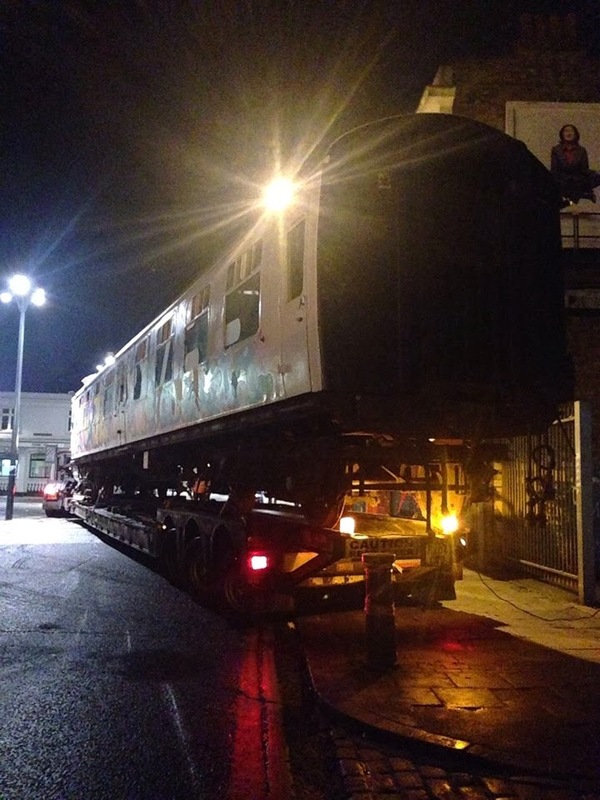 Update: The train left tonight at just before midnight. Bye for now! 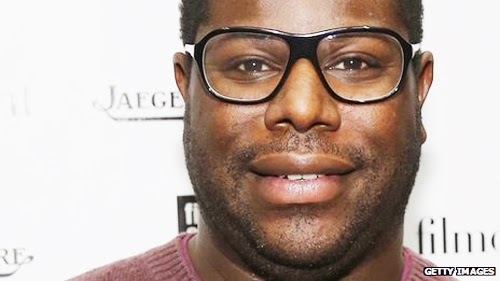 Although Oscar nominated film director Steve McQueen grew up in West London, it was when he was at Goldsmiths College doing his Fine Art degree that he realised his love of film. As he said on the Culture Show on BBC last night (and echoing many a Goldsmith Fine Art under-graduate who thinks they're on the wrong course), "When I was at Goldsmiths, I wanted to be at film school...and when I went to (Tisch film school in New York) I only stayed 3 months". He felt stifled by the limitations there – the Goldsmiths ethos had turned his head. For McQueen, "it was all about ideas". 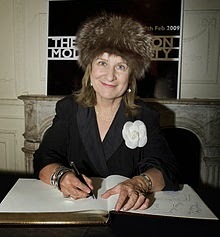 He went on to win the Turner Prize in 1999 after making several highly distinctive short films. The 12 Years A Slave director is now working towards a new BBC drama about the lives of black Britons, claimed to be 'epic in scope' and covering 1968 to the present day, says the BBC. What better hands could such a high profile project be in that are in charge of a story about black people from all walks of life living in Britain in a period spanning fifty years? Was there an open competition to which perhaps the UK's most talented black dramatists who've been working in theatre all these years might have pitched? Oh well never mind. Good luck, Steve, we're looking forward to it! Ask your writers to get in touch with your Deptford cousins, we don't want all the London scenes set in Notting Hill and Brixton, it was all gwan here y'know. 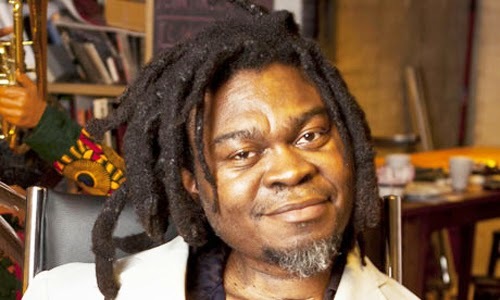 Meanwhile, another great artist and Goldsmiths Fine Arts Degree graduate, Yinka Shonibare MBE, is showing at the National Maritime Museum until 23 February. Shonibare, who was shortlisted for the Turner Prize in 2004, turns all the reverential baloney about Nelson on its head – by introducing new photographs into the museum's collection of paintings of Nelson at the Queen's House. In Shonibare's reconstructed likenesses of the paintings, Nelson is accompanied by the black people who might inevitably have been there at the time if they hadn't been wiped from history (the short-focused history recorded and collected by the privileged of the time and henceforth). The exhibition includes Shonibare's trademark Dutch wax 'African' printed costumes for Nelson and his lover, plus a beautiful outdoor sculpture of a flag in the Queen's Park on the Trafalgar Road side. His better known "Nelson's Ship in A Bottle" sits on the Greenwich Park side, originally displayed on the fourth plinth at Trafalgar Square and subsequently acquired by the Museum. A further work is displayed at the Observatory but you'll have to pay to get in. At a public talk at the NMM late last year, Shonibare said that when he was young he'd always felt "museums were not for him and his like", but now he was "on the inside to change things from the inside out". It's no coincidence that Royal Museums Greenwich are making a special effort to address their hitherto highly narrow, blinkered and colonial approach to British Naval History by inviting Shonibare to tinker (they say "infiltrate") with their collection. Don't miss – and it's free. The fight to save Deptford's immense heritage on the site of Deptford Royal Dockyard from the owners of Convoys Wharf (Hong Kong developers Hutchison Whampoa, owned by the world's 8th richest billionaire, Li Ka Shing) is gathering momentum, as local campaigners work to influence Boris Johnson and the GLA, who, at the developer's request, took over control of the application from Lewisham Council in October 2013. Boris has promised the developer that he will make a decision by the end of February. Lewisham Council is now a Statutory Consultant on the application, and last week their Strategic Planning Committee voted to reject it in its present form and back their planning officers in their continued negotiations with the GLA and developer. They want important amendments to be made before the application is approved. The Council thoroughly support the local heritage projects Build The Lenox and Sayes Court Garden, who have yet to secure the right conditions on the site or a full commitment from the developer. See Deptford Is... for a brief digest of Lewisham's proposals and amendments. 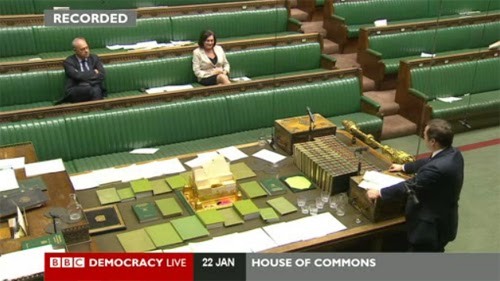 Yesterday, Deptford's MP Dame Joan Ruddock spoke on record to Ed Vaizey (Minister for Culture, Communications and Creative Industries) in an "adjournment debate" in the House of Commons. She presented the history of the site and asked Mr Vaizey to bring his influence to bear on the matter of its sensitive redevelopment in relation to the heritage assets and the local heritage projects. Vaizey, who had taken advice from English Heritage to prepare for the debate, thanked Ms Ruddock for bringing the site to his attention and offered his support. See the half hour debate here or here. Read the transcript published here. Read Deptford Is... for a summary. Also see our analysis of this application and its owner here. 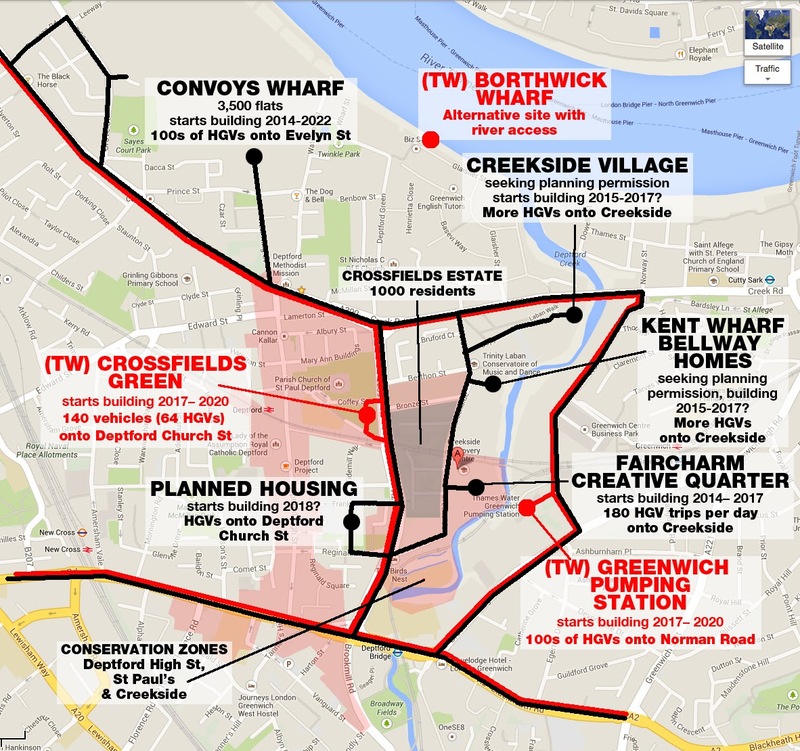 Thames Tunnel campaign update and diary dates – how it affects Crossfields! This week four Crossfields residents took part in the pollution testing organised by Don't Dump on Deptford's Heart (see here). The aim of this 'citizen science' project is to show that there are already very high levels of pollution from traffic on Deptford Church Street – and therefore the proposal to site a Thames Tunnel worksite on Deptford Church Street and close two lanes of the road for three years whilst construction takes place would be seriously detrimental to local residents. The proposal to partially close Deptford Church Street from 2017-2020 (in which bus stops will also be moved and bus times slow down) is all the more insane since there will also be an influx of heavy construction traffic not just from the proposed Thames Tunnel site next to St Paul's Church, but also from the redevelopment of Faircharm Trading Estate on Creekside, and potentially from the redevelopment of Convoys Wharf and other development sites. 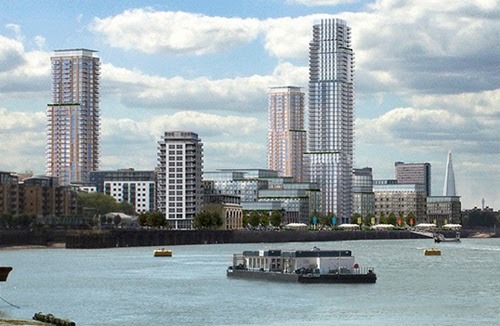 Crossfields residents will also suffer on all sides from the noise, vibration and dust of the Thames Tunnel works, since construction work will also be taking place at Greenwich Pumping Station. 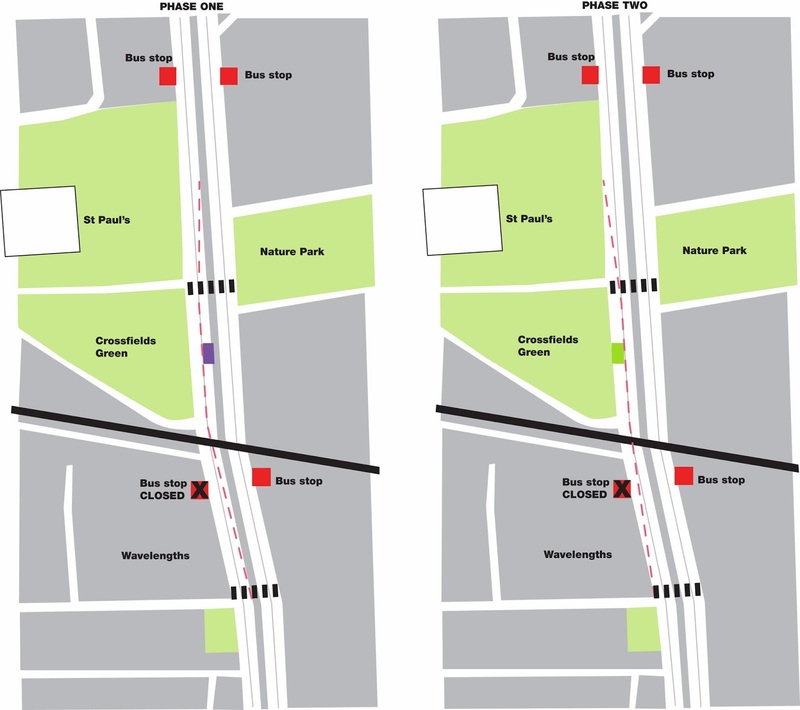 A tunnel linking the two sites will be bored under the Farrer House lawn (very close to the block – see the map here). There will also be two primary schools affected – St Joseph's and Tidemill. The government Planning Inspectors are presently considering the Thames Tunnel proposals and have scheduled a visit to the Deptford Church Street site. Unfortunately this is possibly the quietest time of the day at the quietest time of the year for traffic, so we need to let them know our objections in other ways – vocally, and by demonstrating present and potential uses of the site. If you own a dog, bring your pooch along for a Big Dog Walk at 2pm! Anyone can come to this and have their say, but you must register (whether you want to speak or not) between 8pm and 8.30pm. Please come to this meeting to show your support. When asked to speak you can simply say you support what has previously been said. This takes a bit more time and thought, but if you have objections and have not previously written into Thames Tunnel, you have until 13th January to add your "evidence" for the Planning Inspectors. Write to thamestunnel@infrastructure.gsi.gov.uk. You can read what other people have written here (Don't Dump on Deptford's Heart), here (Joan Ruddock), here and here (Crossfields residents), here (Lewisham Council), here (local resident). 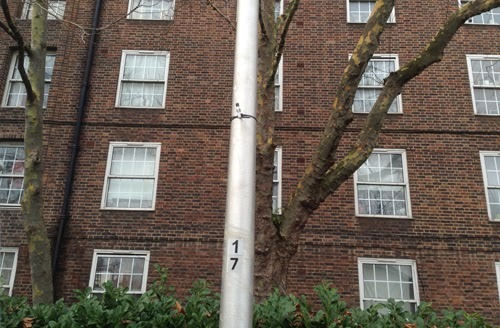 Over 50 diffusion tubes have been placed in and around Deptford Church Street, Creek Road and Deptford Broadway. They will stay up for a month then be submitted to a lab for the results.